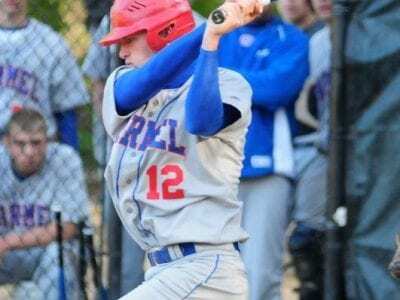 Carmel’s Ryan Shilling had a two-run homer and three RBI in win over Brewster last Thursday. CARMEL—The Carmel High baseball team continued its hot play last week, hammering out a 7-2 League 1-B win over Brewster last Friday night at Dutc… Please login below or purchase a subscription to the Putnam County Courier to access this content. Greg Hodge and Shawn McDonnell pass baton in relay competition at league championships. BREWSTER—For the second year in a row, the Brewster High boys and girls spring track teams are League 1-B Champions. Competing over Tuesday and Thursday of … Please login below or purchase a subscription to the Putnam County Courier to access this content. 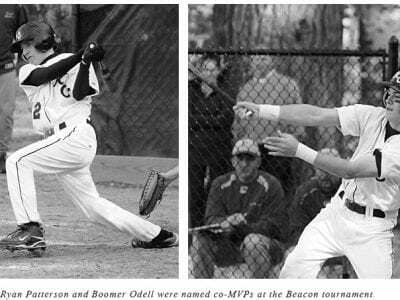 SOMERS—The John F. Kennedy Catholic High baseball team remained sizzling hot last week, as the Gaels rolled over North Salem, 7-1, last Wednesday, then blitzed past Tappan Zee, 11-1, and Beacon, 17-4, to win the DawgFest Tournament title… Please login below or purchase a subscription to the Putnam County Courier to access this content. 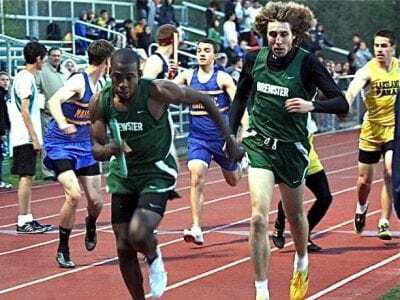 SOMERS—The John F. Kennedy Catholic High School track and field team stayed local this weekend and competed in the Somers Lions Club Invitational. The girls finished 19th overall, and the boys tied for 23rd overall, over 30 teams competed on b… Please login below or purchase a subscription to the Putnam County Courier to access this content. BREWSTER—The Brewster High boys lacrosse team had eight players reach the scoring column in a 14-7 win over Wappingers at home last Thursday. Brewster also dropped a 12-4 decision to Mahopac two days earlier on the road. Thursday against Wap… Please login below or purchase a subscription to the Putnam County Courier to access this content. Erin McCrudden (4) of PV heads toward the goal, as Kennedy’s MacKenzie Feehan defends. PUTNAM VALLEY—It was a good week for the Putnam Valley high girls lacrosse squad. Friday the Tigers went to Kennedy and came back with a 16-7 victory, … Please login below or purchase a subscription to the Putnam County Courier to access this content. 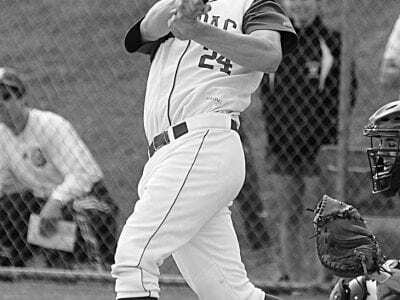 Paul Harnish had a three-run double and finished with four RBI in a ‘Pac win over Panas. MAHOPAC—Thanks to some strong pitching and clutch hitting, the Mahopac High baseball team was able to win a pair of road games against League 1-B opp… Please login below or purchase a subscription to the Putnam County Courier to access this content. SOMERS—The John F. Kennedy High School girls lacrosse team defeated Keio 17-7 on the road last Thursday. That victory was sandwiched between a 14-5 loss at Ossining last Wednesday and a 16-7 defeat at the hands of Putnam Valley on the Gaels&rs… Please login below or purchase a subscription to the Putnam County Courier to access this content. Ryan Fitzgerald fires a shot in recent action. 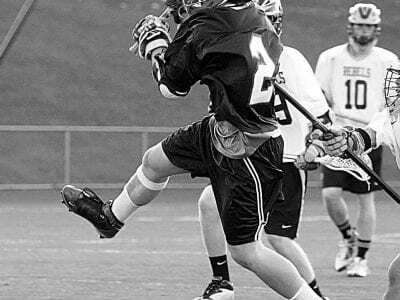 Fitzgerald had 12 goals and 11 assists in three PV wins last week. PUTNAM VALLEY—The Putnam Valley High boys lacrosse team picked up three wins last week, rolling past Byram Hills, 10-4, Saturday, … Please login below or purchase a subscription to the Putnam County Courier to access this content.